​​There’s a story that’s been printed in more than one wrestling publication about a show that took place in Louisville. The main event involved two women, the world champion Mildred Burke, and a hillbilly rassler who called herself Elvira Snodgrass. According to Sid Feder’s Wrestling Fan’s Book, the two women once drew a crowd of over 18,000 in the River City. The story is a fabrication, the kind of humbug that typified pro wrestling in its golden age. Not only is there no record of such an event taking place, the Allen Athletic Club didn’t have access to a venue large enough to accommodate such a crowd. Nevertheless, tall tales like these survive because they have a ring of truth. 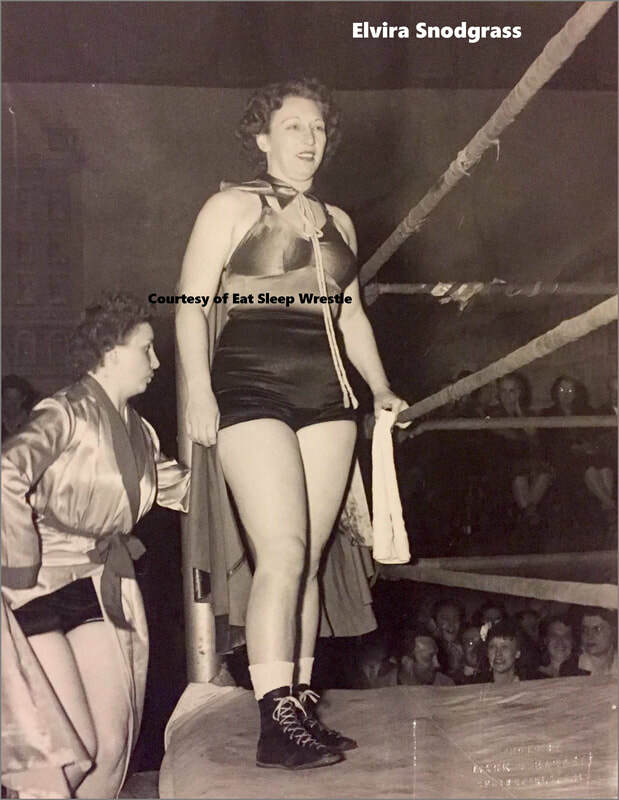 Mildred Burke was the queen of wrestling for nearly twenty years, and for at least a dozen of those years, Elvira Snodgrass was one of Mildred’s toughest opponents. Snodgrass made her Louisville debut in 1941. She quickly established herself as one of Burke’s stiffest challengers. Although the crowd of 18,000 may be only a myth, there is one kernel of truth to the story: Burke and Snodgrass were a huge draw for Allen Athletic Club during World War II and even appeared in the main event on one occasion. Depending on where she was booked, promoters billed Elvira as a native of Tennessee, Kentucky, Arkansas, or Ohio. She was also briefly billed as a resident of Hollywood, thanks to her appearance in a short film made in Tinseltown during the early 1940s. Elvira's real name was Gutherine Fuller, and she was from Varnado, Louisiana. Her mother was a half-blooded Cherokee, and Elvira was proud of the fact she had "Indian blood" in her veins. Her first marriage was at an early age when she married Johnny Smith. Her only child was named Mae Bell Smith. Elvira was married three times to Johnny Smith, Elmer Snodgrass (whose real first name was Bob), and Paul Hazelbaker. According to Aubrey Fuller, Elvira’s nephew, Elmer Snodgrass, was the strongest person he ever met. "My dad was a very strong man whom no one would pick a fight with, but he said Elmer Snodgrass was the strongest person he had ever seen. Dad said he could pick up a bale of cotton on his back and walk off with it. My dad was not prone to tell lies, so I always believed him." According to the 1930 US Census, Gutherine and her first husband Johnny were living with Gutherine's parents with their daughter in 1930, along with all her younger siblings, including Aubrey's father. By 1940 she had moved out, but daughter Mae Bell was still living with her grandparents. "Life was tough in rural Louisiana in the early part of the 1900s," says Aubrey Fuller. "In 1940, my dad reported approximately 450 dollars for a full year of work. Aunt Gutherine didn’t like the hardships of the area and moved to greener pastures." Elvira claimed that her wrestling career began in Bowling Green, Kentucky. She was married to Elmer Snodgrass at the time, and he taught her some of the tricks of the trade. Elvira saw women wrestling women for the first time on a trip to Toledo, Ohio, and she decided to give it a try. After her divorce from Elmer Snodgrass, Elvira hit the road alone. She worked for Billy Wolfe, Mildred Burke’s husband, and she often found herself in the ring with some of Wolfe’s toughest competitors, including Burke, Gladys “Kill ‘Em” Gillam, and Mae Weston. Elvira loved to get airborne, using a flying mare and a drop kick as part of her arsenal, but true to her backwoods roots, Elvira could get down and dirty when necessary. In the early days, Elvira played the hillbilly role for all it was worth. Dressed in a bonnet and high top shoes, she looked like a character straight out of Lil Abner. In time she would lose the hillbilly fashion and replace them with a collection of capes she made herself. One cape, covered in sequins, was reportedly valued at $850. At the height of her fame, Elvira was making $8,000 a year. Like most of the lady wrestlers, Elvira kept herself well-groomed, but she did not have the same love of furs and jewels that Burke possessed. A wrist watch, earrings, and a ring with three small diamonds were her only indulgences, as she kept her dress casual but elegant. She also had a heart tattooed on her arm with the nickname “Red” written in the center. After she gained fame as a wrestler, Elvira would make trips back to Bogalusa, Louisiana to see her family. She would let everyone know in advance when she would be home so that all of the nieces and nephews could be together when she came for her visit. "When she arrived, she would enter the building, throws handfuls of pennies, nickels, and dimes on the floor and holler 'Razoo!' She loved to see the children scrambling for the money." "When Aunt Gutherine visited Bogalusa, my mother would bake her a 4-5 pound fish called a buffalo. They are members of the carp family. They are not very tasty and smelled even worse as it was cooking in the oven. I never understood why she liked that fish." Elvira took great pride in her longevity. Pro wrestling has always been a hard business, and women especially did not last more than a few years. Elvira saw many competitors come and go, and she was proud to have worked so hard for so long, appearing in close to three thousand matches by her own count. Elvira might have been born a simple country girl, but she was a genuine star who worked every state in the union - including Illinois, where women’s wrestling was illegal. “I was bootlegged onto a card in East St. Louis under a boy’s name,” she bragged. The accident Fuller referred to was a car accident that took place on U.S. 42 near Florence, Kentucky. A few newspapers carried a blurb about the incident, listing her injuries as a compound fracture of her left arm and scalp lacerations. The truth is far more ghastly, and proof that Elvira was one of the toughest women in the history of wrestling. Elvira was driving alone, as was her custom, on that fateful night. She rolled her car into an embankment, just out of sight from the road. According to her niece Katha Edward, who spent many nights at her Aunt's house before and after the incident, Elvira had her arm hanging out the driver's window when she rolled the car. Her arm was badly mangled and pinned, and she was unable to get her arm free. She waited a long time for help to come, but when help never arrived, she did what she had to do. She cut the arm off just above the elbow herself. Once free of the vehicle, she crawled back up to the road and sought medical help. It seems incredible such a story would be toned down for the newspapers, but it’s very likely some kayfabe was involved in covering up the story. Both Katha Edward and Aubrey Fuller confirm the story as true, and Wild Bill Zim’s personal scrapbook includes a note about Elvira losing an arm in a car accident. Elvira was able to recover in time, and while this rumor is yet to be confirmed, family members say she wrestled again with just one arm! Another rumor I had come across said that Elvira had died of a suicide. That story didn't sit right after hearing how she had survived the car crash, and I can confirm the rumor is false. Elvira died at an early age from the same cause that Aubrey's father and a few of his uncles: cardiac arrest. His niece Katha was staying with her when she passed. She died in Columbus, Ohio, and was buried in Glen Rest Memorial Estate on East Main Street in Reynoldsburg, Ohio. Elvira was a free spirit, who followed her dream and did things her way. Her spirit lives on today in the indie workers wrestling for Shimmer, SHINE, WSU, and other promotions showcasing women’s wrestling. Author: John Cosper of ​Eat Sleep Wrestle.